Up to the autumn skies. This verse is a good example of a picture verse, intended to call up the scene to one's imagination. Jaku-ren was another of the great Fujiwara clan, and lived about the end of the twelfth century. 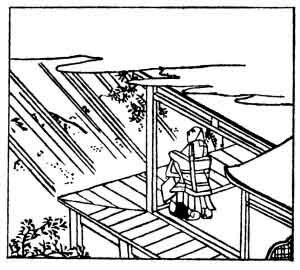 Murasame means 'rain falling in showers, here and there', and the illustration plainly shows it raining on one side of the house only.